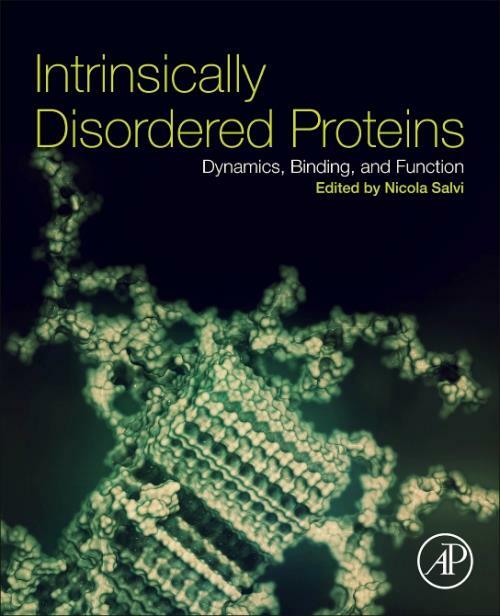 Intrinsically Disordered Proteins: Dynamics, Binding, and Function thoroughly examines the fundamental biochemical functions of IDPs and IDRs, including signaling, binding and regulation. The role of new mechanistic, computational and experimental approaches in IDP study are explored in-depth, along with methods for the characterization of IDP dynamics, models, simulations, mechanisms of IDP and IDR binding, and biological and medical implications. In addition, leading researchers in the field of IDPs and IDRs contribute chapters on IDP approaches little explored to-date, such as ensemble descriptions of IDPs and IDRs, single-molecule studies of IDPs and IDRs, IDPs and IDRs in membraneless organelles, and more. Dr. Nicola Salvi is a research scientist at the Institut de Biologie Structurale in Grenoble, France. After receiving his doctorate from the Ecole Polytechnique Fédérale de Lausanne, Switzerland, under the supervision of Geoffrey Bodenhausen, he held a postdoctoral appointment at Harvard Medical School. Dr. Salvi is an expert in characterizing protein dynamics using nuclear magnetic resonance spectroscopy. He developed hybrid approaches in which spectroscopic evidence on intrinsically disordered proteins (IDPs) is combined with molecular dynamics simulation to obtain insights into the functional dynamics of IDPs. Dr. Salvi's studies led to identifying mechanistic paradigms of IDP motions, with important implications for our understanding of their function.